Arianespace has demanded that part of the payment for the two future launches be made before August 15, this paper has learnt. BANGALORE: French satellite launch firm Arianespace has shot off a letter to the Indian Space Research Organisation (ISRO), forcing on it a condition to launch India’s GSAT-11 communication satellite — that it will be launched only if ISRO sends two of its other communication satellites, GSAT-30 and 31, for Arianespace to launch, The New Indian Express has learnt from reliable sources. This could push the launch cost of the satellites, something which could have been avoided. The launch of the two satellites by Arianespace is expected to cost Rs 950 crore. Indian Space Commission had sanctioned `960 crore towards design and manufacturing of GSAT-30, 31 and 32. Sources said following the letter sent to ISRO in mid-July, ISRO petitioned the commission seeking an additional `950 crore to launch GSAT-30 and 31 from Arianespace. 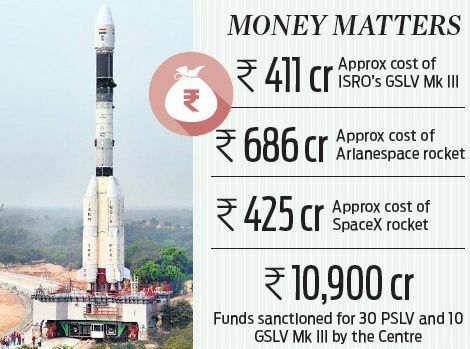 This comes after the Union cabinet cleared Rs 10,900 cr in June for 30 PSLV and 10 GSLV Mk III launches in four years, which would have included GSAT-30 and 31, both initially weighing 2.6 tonnes. ISRO has decided to increase the lift-off mass of the GSAT-30 and 31 satellites by an additional 500 kg to 3.1 tonnes. This situation, sources in the U R Rao Satellite Centre (URSC) (formerly ISRO Satellite Centre) said, has caused much bitterness among the senior Indian space scientists over extra costs incurred despite having the capability to launch these satellites indigenously from its launchpad at Sriharikota (80 km north of Chennai), using its GSLV-Mk III satellite launcher. The GSLV-Mk III can launch satellites weighing up to 4 tonnes. The GSAT-11, weighing 5.7 tonnes, had to be launched by Arianespace due to its weight. It is to be a replacement for INSAT-4CR for providing DTH (direct-to-home) connectivity and other services to many operators. The opposition of former Space Applications Centre Director Tapan Mishra to this proposal by ISRO, succumbing to Arianespace, resulted in his subsequent transfer, say sources in ISRO. ISRO has claimed it was seeking the services of the French firm due to “uprating failure” of the indigenously developed GSLV-Mk III to launch GSAT-30 and 31, which were scheduled to be launched on board the GSLV Mk III at 60% of the cost charged by Arianespace. The New Indian Express has learnt that all this was caused due to GSAT-11 being recalled from Kourou where it was sent for the May 2018 launch. Based on a report of a former director of URSC regarding the failure GSAT-6A, the launch of GSAT-11 was delayed and the satellite was shipped back to India from Guiana Space Centre, French Guiana, to check for possible flaws in the satellite. The cost of transport along with transit insurance was estimated to be Rs 90 crore. The recall was for carrying out “modifications” to prevent any repeat of power systems failure that had occurred in March-end on board GSAT-6A, with which ISRO’s ground stations lost contact following a launch from Sriharikota on March 29, 2018.Sources in URSC sad the decision to ship the satellite back to India was made despite opposition from directors of various ISRO divisions. The decision resulted in ISRO missing the launch date of an important communication satellite. Soon after, Arianespace said it could only provide a launch window at the end of 2019 as ISRO had missed its schedule. As ISRO was in a pickle with Arianespace, the French firm provided a new window of November 2018 for launch. Now, this delay and the missing of the May launch window due to the GSAT-11’s recall to India has come as a gift for the French firm which appears to have decided to force ISRO into an agreement for launching two additional satellites. Sources said the directors had insisted that adequate care had already been taken to prevent a GSAT-6A-like failure on board GSAT-11 and that it was not necessary to ship the satellite back to India. As the recall led to missing of the May launch window, there is actually a penalty clause imposable on ISRO. The penalty amounted up to 5% of the Rs 550 crore estimated to be the launch cost of GSAT-11. Despite such a clause existing in the GSAT-11 contract for such eventualities, ISRO did not activate the penalty clause and instead chose to send a proposal to the Space Commission for release of additional funds to the tune of Rs 950 crore. The proposal sought permission to procure launch facilities for GSAT-30 and 31 from Arianespace. TNIE sent a set of questions to ISRO Chairman Dr R Sivan and Rajendra Singh Byali, Director of Publications and Public Relations unit, on June 26. A response is still awaited. TNIE also reached out to members of the Space Commission. While former ISRO chairman and member of the Commission A S Kiran Kumar said he was “not aware of the issue”, another member - who did not wish to be quoted - refused to respond.